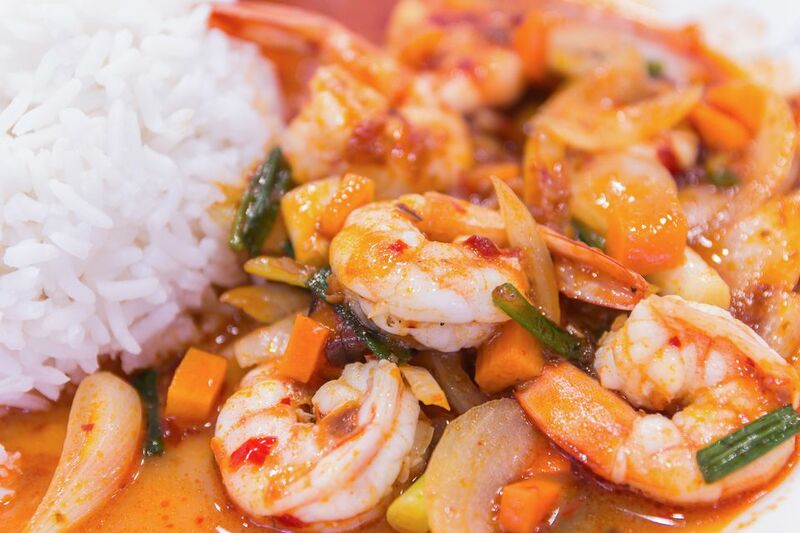 Curry paste adds flavor to shrimp, carrot, peas, and red bell pepper in this easy curry shrimp recipe that takes less than 20 minutes to make. This stir-fry pairs perfectly with rice or noodles. Soak the shrimp in warm salted water for 5 minutes. Rinse in cold water, drain and pat dry with paper towels. Shell, devein and chop. Peel and slice the carrot into 1/2-inch slices on the diagonal. Cut the red bell pepper in half, remove the seeds and chop into chunks. In a large pot filled with boiling water, briefly blanch (parboil) the peas and carrots until the peas turn bright green, and the vegetables are crisp but still tender. Remove, plunge briefly into ice cold water, and drain thoroughly. Heat a wok over medium-high to high heat. Add 2 tablespoons oil to the heated wok. Add the ginger and stir-fry briefly until aromatic (about 30 seconds). Add the shrimp. Stir-fry until they turn pink. Remove the shrimp from the pan. Heat 1 1/2 tablespoons oil to the wok. When the oil is hot, add the curry paste. Heat briefly until it is aromatic (30 seconds to 1 minute). Add the carrots. Stir-fry for 1 minute, then add the red bell pepper. Add the peas. Stir-fry briefly, then add the shrimp back into the pan. Mix everything together and cook for 1 minute, then add the rice wine or sherry and the sugar. Cook for a bit longer and serve hot.